We manufacture and export a wide array of Beaded Scarfs that is used in garment or home furnishing accessories. These Beaded Scarfs are available with various embellishments, fringes and trims. 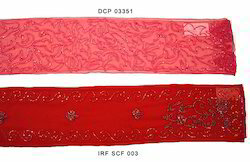 Our range of Beaded Scarfs is designed in compliance with latest market trends for the fashion conscious clients. Beaded scarf is a very widely used fashion accessory and is made available in a huge segment of colors, shapes and sizes. Beads, along with sequins, are used to create beautiful designs on the tassels, fringes, curled edges, etc. Of the scarf. in fact, beads have been used for ages as they provide a classy look, helping stand out in the crowd. Looking for Beaded Scarf ?